If all this winter and grey weather is making you gnash your teeth and long for sunny skies, may I suggest losing yourself in a bottle of Gillespie’s Raspberry Gin? Fresh and sweet, tart, bright and smoothly boozy, it tastes of summer and sunshine. Made in Squamish by two of the nicest folks you’ll meet using all B.C. raspberries, this is delicious over ice with a splash of soda and squeeze of lemon. Or try it as a Clover Club, shaken up on ice, then strained with a little lemon juice and egg white for a creamy prohibition cocktail. Whistler heroes Peaked Pies are coming to the West End very, very soon at 975 Denman between Nelson and Barclay. Inspections permitting, they should open at the start of December. Along with their fan-favourite pies (such as steak, bacon and cheese and The Hopper—Kangaroo infused with Cabernet-Merlot balsamic reduction), they’ll also have breakfast pies, sweet pies, Australian deserts such as the Lamington and Aussie-style coffees such as the Flat White. New for the VanCity location: thick-sliced toast with vegemite! Just to recap on that, breakfast pies! They’ll be open from 8 a.m. to 9 p.m. daily. Breakfast pies available from 8 a.m. to 11 a.m.
A kind friend bought me some takeout the other day: roti and a side of curry dip from Chef Angus An’s Fat Mao. Oh. My. God! Possibly the most incredible thing I’ve eaten all week: the roti was so buttery and chewy! Such great flatbread and honestly the best I’ve had in Canada. Chef An has a supplier that makes them specially for Fat Mao by hand: "They taste the closest to the ones I've had in Asia," he says. I agree. Use it to sop up that curry sauce and go straight to taste bud heaven. Creamy and rich with a terrifically well-balanced hit of heat and warming aromatic glow, this is perfection in a little bowl. Apparently it’s a ‘koh soi curry’ and it’s also on the menu with chicken Changmai noodles. So I think we all know what I’m ordering next time I’m there. I’m cutting the ribbon on Christmas fun and holiday treats and from now till January, absolutely everything I drink will come with a side of eggnog. And because it’s the best goddam ‘nog west of the Rockies, it’s obviously going to be Avalon's full-fat beastie. Go, stock up, give in to the joy of nog-laced latte in the morning and try gin-spiked nog for an evening treat (shake it over ice and strain—that little dilution makes all the difference and it’s lighter than rum). Cheer wildly in the streets, because Mensch Jewish Delicatessen has begun serving Sunday brunch from 11 a.m. to 3 p.m. Taking a break from their usual menu, they’ll be whipping up house-made treats such as hot Pastrami on latke hash, eggs on lox, and for those who have a sweet tooth, cheesecake blintzes. Seating is limited and there are no reservations. My recommendation is to get there early with friends and share, you don’t want to miss out on trying any of this! Burdock & Co, Cacao and Homer St Cafe and Bar will be hosting three very special dinners with three of Mexico’s top chefs in December. Over three nights of events, the Mexican chefs will serve special menus introducing diners to authentic dishes and techniques. The Sabores CDMX dinners will take place on Thursday December 8th, Friday December 9th and Saturday December 10th. The visiting chefs, José Manuel Baños of Aguamiel, Mario Espinosa of La Encomienda Polanco and Gerardo Vázquez Lugo of Nicos (named this year as one of San Pellegrino's World's 50 Best) are likely not in town again so snap up tickets to these amazing dinners now! Latte Art Throw Ho-Ho Down is billed as "a merry exhibition of barista talent." Entry is by donation of food/clothing to the Lookout Society, with prizes, cookies and beer (and, I’m guessing, a latte or two) on Dec 1st at 5:30 p.m. at the Espressotec Barista Lab (1015 Clark Drive). ELEMENTA is hosting its final pop-up dinner of the year and collaborating with Postmark Brewing for drink pairings. Celebrating the last of fall produce, vegetables from the cellar, ferments from the summer, wild edibles from the forest and ocean, as well as shellfish from the cold waters of the North Pacific, ELEMENTA will be serving up a seven-course menu canapes, bread service and petit fours. Get your tickets now! So it’s the season for giving and as this is a column all about food and drink, let’s maybe think about giving to the amazing community who keep us fed and (hurrah!) drunk all year-round: the people in the hospitality industry. He’s done it again, folks! Robyn Gray, inventor of the now world-famous ‘Inception Negroni’ (that amazing drink-within-a-drink) has a couple of new creations which are set to thrill any geeky boozehounds out there. Second: try the Blue Cheese Martini. Bombay Sapphire or Tito’s Vodka are sous-vide fat-washed with the Okanagan’s delicious Poplar Grove Tiger Poplar blue cheese to give a velvety creamy cheesy hit to a boozy bar standard. Garnished with a blue cheese-stuffed olive, this could be my new favourite post- or pre-dinner drink. Try them both at Prohibition in the Rosewood Hotel Georgia. I am as guilty of anyone else in the city’s food and drink scene when it comes to getting in a froth about newnewnewnewnew! But let’s take a pause and go see old friends this season. Make a plan and stop by this trio for their happy hours and prepare to fall in love all over again. I don’t know what they’ve done to change it, but Wildebeest’s fried chicken just knocked out everything else in competition and it’s half-price (just $6!) before 6 p.m. Do not even think of sharing. We made that mistake and just wound up ordering one each. Insanely good! There are eight tasty treats to choose from on the menu, including their ambrosial smoked Castelvetrano olives which are on for just $3. I haven’t hung out at Tableau for a while but believe me—after an amazing dinner there last week (Steak tartare! Sweetbreads! Duck confit! )—I will be remedying that in the future. Your motivation is their new happy hour, serving up a slew of half-price goodies, including their terrific burger and fries ($9) and cheese and charcuterie boards ($9). French sparkling wine, and red and white Rhône blends are being served for $5 a glass. Best of all, it’s a double happy hour, on from 2:30 to 5:30 p.m. and again from 9:30 p.m. till close. Finally a major shout-out to Timber who just had their first anniversary! They'll be celebrating by pouring the city’s favourite charity-supporting Les Dames wines created by Mireille Sauve (from Okanagan grapes) with funds going to support scholarships for women in the city who want to further their culinary/wine/spirits knowledge and careers. You can get a glass of red or white Les Dames for $7 from 3 to 6 p.m. My tip? Pair with $3.50 deep-fried cheese curds. 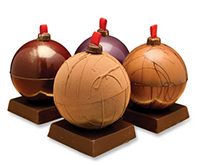 Canada is beginning to make a name for itself on the world chocolate stage and although B.C. didn’t come home with as many awards as Ontario (who just seems to be nailing it right now) in the recent International Chocolate Awards, we can be pretty proud of the exceptional quality on offer across the province and right here in VanCity. I checked out three festive collections from a trio of our finest and was seriously impressed. It’s so beautiful! I never want to eat it. But, it’s chocolate, I must have it. I cracked and nibbled a perfectly sculpted wing and man, this is such creamy milky chocolate. Wonderfully smooth, sure it’s a dream for kids but I’m thinking a few big kids I know would love this too. Beta5 should already be on your radar if you’re any kind of foodie, thanks to their elevated and creative take on all things sweet. Their ‘Christmas in Paris’ collection is the perfect self-gift (or for anyone else you love) in six- and twelve-piece boxes with treats such as the popping candy-filled sparkling praline inside. 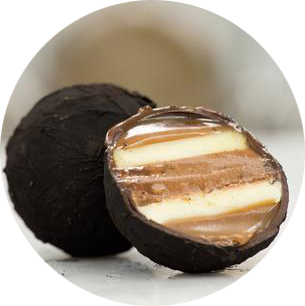 Other standouts include a Lump of Coal (pictured): sure, you’ll end up with ‘sooty’ fingers (really, you do) but who cares when you have a mouthful of rum-eggnog chocolatey goodness? There’ll be no tears shed at finding this in your stocking. Pastry fans, never fear! There is something for you too and I cannot wait to try the Douglas Fir eclair when it comes out on December 3rd. Thomas Haas has outdone himself this year—obviously his stollen game is still roaringly wonderful (I kind of love it when you have a few slices left and can have it toasted. So good)—but his collection of Christmas chocolates is just beautiful too. Once you’ve done admiring the perfect festive bauble (pictured), crack it open to discover a wealth of chewy, nutty chocolate-y treats. At last! The most indulgent month is here, tempting us at all times to have that one last drink, to take that extra cookie and generally make a festive hog out of yourself. Hurrah! So what better month to dive into all the delicious things that Vancouver has to offer? And to help you make every decadent mouthful count, here’s my indispensable guide to everything you've gotta eat and drink in December.